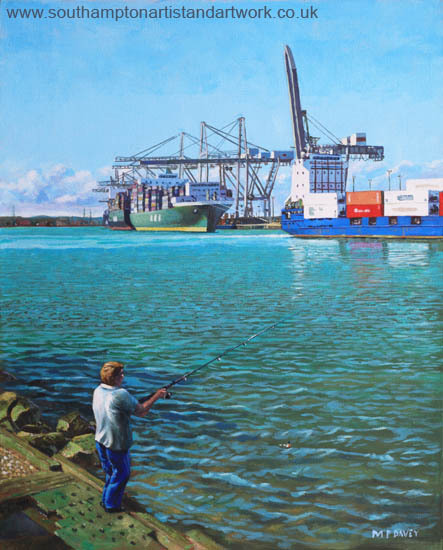 This painting shows a man fishing at Marchwood on the River Test, Hampshire. On the opposite side of the River can be seen part of the Container Terminal at Southampton Western Docks, the second largest in the UK. Three large container ships can be seen moored at the facility, which introduced most of the modern cranes depicted in this painting during 2013/ 14. Another, smaller ship, is leaving the port with a much smaller consignment of containers. The Test is most famous for its Brown Trout and Grayling fish. The painting was done in acrylics on a red ground base using a canvas board measuring 16” x 20”, during spring 2014.